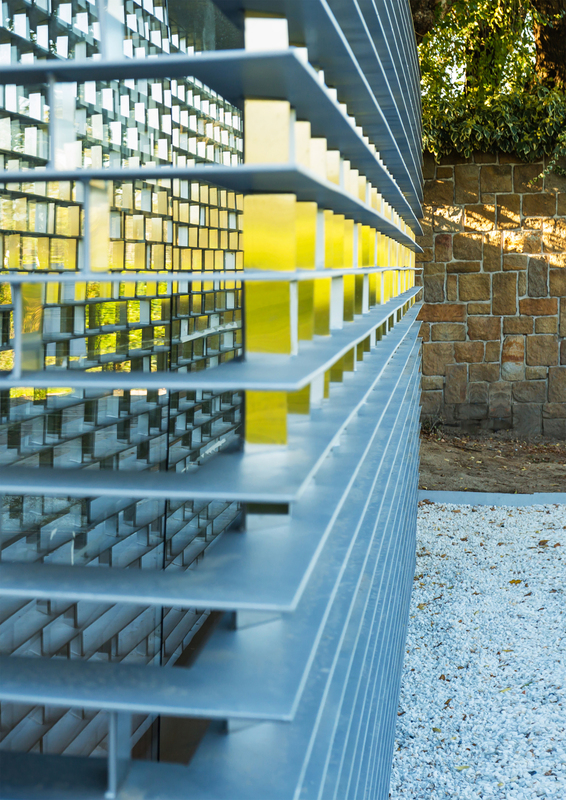 The project is located in an open rear patio between the current administration building, which is partially covered by a pergola with a concrete pillar connecting the opposing sides of the building, and a large protected tree. The expansion seeks to blend in sensitively and rationally with both the existing building and the natural surroundings. 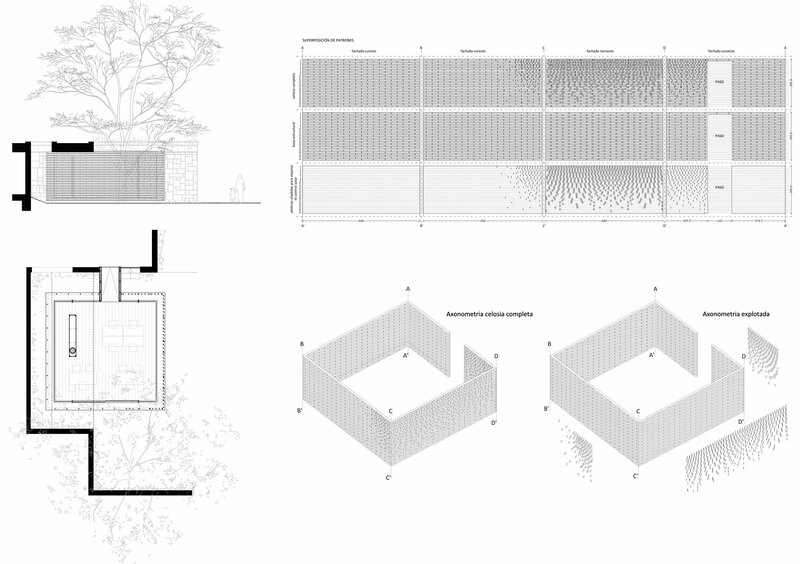 The approach entails making a simple glazed rectangular composition set back into the existing building, sliding under the line delimiting the existing pergola to generate a diaphanous working space. A suspended passage connects the two buildings, using a ramp to span the height difference between the two finished floors. This passage is raised above ground outdoors, allowing the garden to pass under it and emphasising the free-standing nature of the composition. It has two types of outdoor covering. 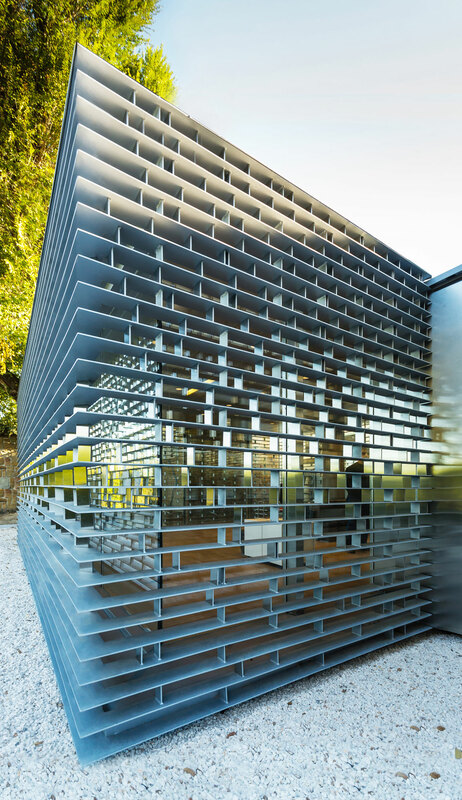 The first is a self-supporting enclosure/lattice of horizontal and vertical steel strips. 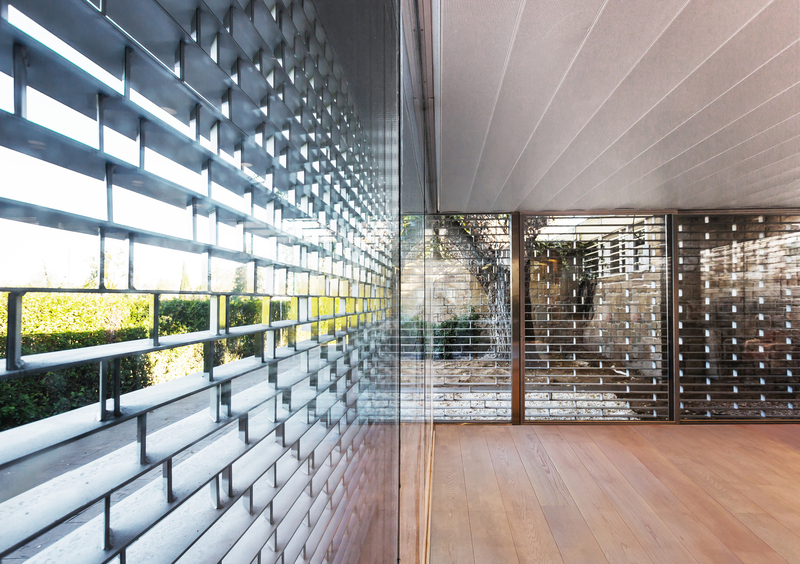 As well as filtering the passage of light and acting as a safety lattice, it functions as protection against the sun, providing comfortable climate conditions inside and helping to optimise the building’s energy consumption. 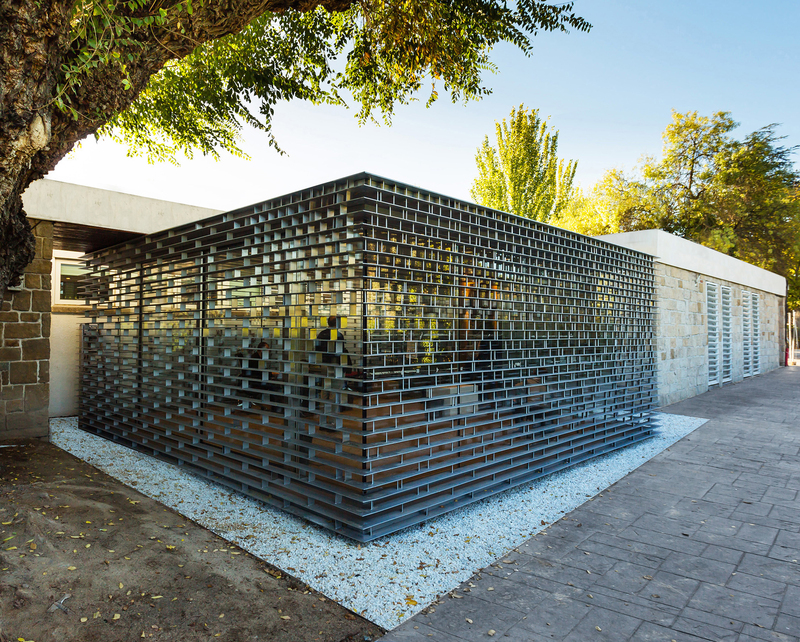 A second glass layer set back from the lattice insulates the space for offices and gives views out into the natural, landscaped setting characteristic of the Casa de Campo district. The configuration of the solar protection lattice conforms to a rigorous study on the amount of sunlight on the various façades. That study led to a lattice design with a homogeneous structural base with a superimposed pattern of rotated vertical strips for sun protection. This pattern forms a continuous gradient, with the lower part less dense and the upper part the densest in the northwest façade. As the rest of the façades need minimal protection from the sun, these are only composed of the basic structural base, except for the parts of the southeast and northwest façades neighbouring the northwest façade, where the density increases to establish a transit space between the dense northwest façade and the other façades. The vertical slats in the rest of the façades are also to be arranged perpendicularly as they have no solar protection function, hence they maximise the entry of indirect lighting, which is highly suitable for office use. The resulting pattern helps to integrate the new building with the existing one, with the pattern formed by the steel slats appearing as a negative image of the concrete joints in the masonry wall of the existing building. 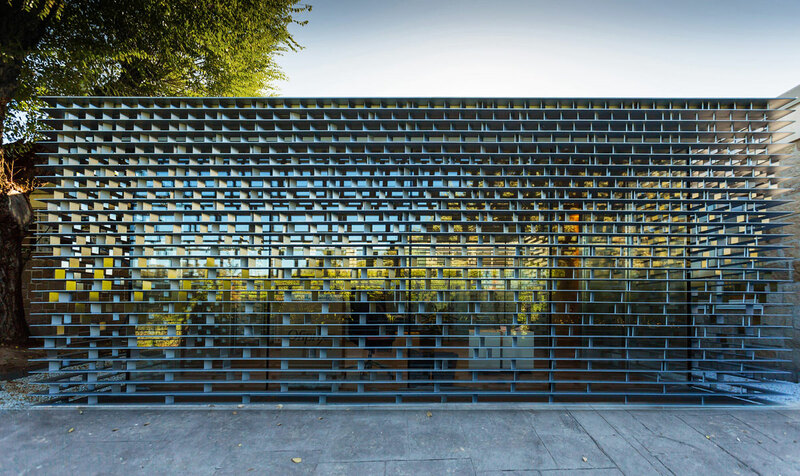 The reflective steel nature of the lattice and the second glass layer help to meld the building with the existing natural environment through their own qualities of reflection and transparency.